The following is a Viewpoint from Ryan Wiser, Mark Bolinger, Ben Hoen and Bentham Paulos, of Lawrence Berkeley National Laboratory. Wind power continues to grow rapidly in the United States, due to the production tax credit, various state-level policies, and improvements in the cost and performance of wind power technologies. The falling cost of wind energy has been attractive to utility, corporate, and other power purchasers. The new 2017 Wind Technologies Market Report, prepared by Berkeley Lab and released by the U.S. Department of Energy, documents trends in wind power cost, performance, prices and technology choices. One technology change has been the increasing size of wind turbines: the average capacity of a wind turbine installed last year is more than three times bigger than twenty years ago. Bigger machines — larger generators, taller towers and longer blades — are a significant factor in the declining electricity cost and improving performance of wind power projects. And wind turbine size is expected to continue to grow. DOE is investigating ways to overcome design and logistical hurdles to even larger rotors. But while the move to bigger turbines has been well-noted, one important trend is getting less attention, the fall in "specific power." Specific power measures the ratio of the generator size to the rotor size. Generators are measured in Watts (W) of nameplate capacity. Rotors are measured, in this case, by the area they sweep (the "swept area"), measured in square meters (m²). Machines with low specific power have a larger rotor size relative to generator size, thus fewer Watts per square meter (W/m²). Since bigger rotors catch more wind, they transfer more energy to the generator. Low specific power wind turbines are not always optimal. In especially high and turbulent winds, such turbines may experience a lot of stress, and larger rotors come at a cost. Such turbines do better in lower wind speeds. In fact, low specific power turbines were originally designed to catch the breezes in lower wind speed sites, whether in parts of the Great Lakes, Mid-Atlantic or Southeastern United States. But, in an ongoing but notable trend, wind power developers have been installing them across the country, even at sites with relatively high wind speeds. The most important reason so far is that such turbines provide greater bang-for-the-buck than standard turbines. The greater revenue from power production and tax incentives more than offsets the higher up-front capital costs and greater wear and tear. Low specific power turbines have helped reduce the cost of wind energy — important in a market currently awash with inexpensive electricity, whether from gas, coal, solar or wind. The primary way in which low specific power turbines do this is by boosting the capacity factor of wind projects, which measures the actual output of a generator compared to the maximum possible output over time. Lower specific power machines, all else held equal, will have higher capacity factors, since a bigger rotor will run their generators closer to or at full capacity more often. The average specific power of wind turbines in the United States has fallen from 394 W/m² among projects installed in 1998-1999 to 231 W/m² among projects installed in 2017. And typical capacity factors for wind turbines have risen to previously unheard-of levels, averaging 42.5% for projects placed in service in 2016, compared to the low 30% range just a few years back. This is partly due to developers building projects in windier areas in recent years and the use of taller towers, but is also a core byproduct of the trend toward low specific power machines. In the future, additional drivers may push the wind industry towards even-lower specific power machines. Namely, turbines with low specific power produce electricity for more hours over the course of a year. High wind speed events, while very energetic, tend to be rare. Low wind speeds tend to happen more frequently in most places. By being in the market for more hours, generators can take advantage of more favorable market prices. As the penetration of wind energy rises in areas like the Southwest Power Pool and ERCOT in Texas, it is having a notable impact on energy prices. Large amounts of wind output in certain hours can drive down the wholesale price for energy — including the price received by wind generators themselves. This "value deflation" dynamic has been documented by Berkeley Lab research for a number of years, including in this recent study. Spreading electricity output to more hours can also help avoid congestion on the transmission grid. High wind speeds create a "rush hour" for getting power out of areas that have many wind projects. Congestion can result in curtailment, meaning wind projects can be shut out of the market altogether. Some of these value-increasing benefits of low specific power machines have been explored in previous research out of Europe, including in a study last year conducted under the auspices of an IEA Wind agreement. 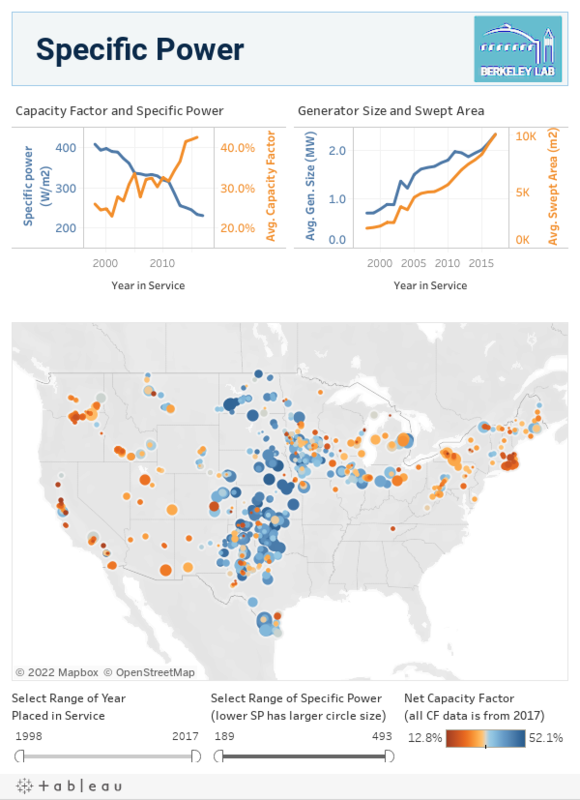 On the data dashboard below, you can see that the trend toward lower specific power turbines accelerated in 2011, as rotor size grew faster than generator size. The graph also shows an explosion in capacity factors, in concert with a continued drop in specific power ratings. On the map, you can see that lower specific power machines have been deployed all over the United States. Lower specific power is indicated with a bigger circle and higher capacity factors are shown in blue. You can use the filters below the map to select time periods and specific power ratings. Holding the mouse over specific projects pulls up more details. To learn more, read the 2017 Wind Technologies Market Report, at windreport.lbl.gov.